Perhaps there’s nothing so scary (or lonely) as feeling completely on your own. When my then-fiance shipped off to Afghanistan, I realized that I had no clue how to deal with deployment. I hadn’t ever seen anyone close to me go through it. I didn’t know what to expect other than the little guidance I had received from watching movies like Stop-Loss and Jarhead. And those movies aren’t really helpful at all. (I mean, really. They’re pretty worthless when it comes down to real life.) I wasn’t part of the FRG–I didn’t even know that I could be part of it… or what an FRG was. I didn’t have an idea what to expect or how to deal with the rush of emotions and questions racing through my head. I was totally on the outside, looking in. I was part of a community of which I wasn’t part. So, like most military significant others and spouses who find themselves in the exact same position, I turned to the internet to ask questions and deal with the very terrifying reality of sending a person you love to war. 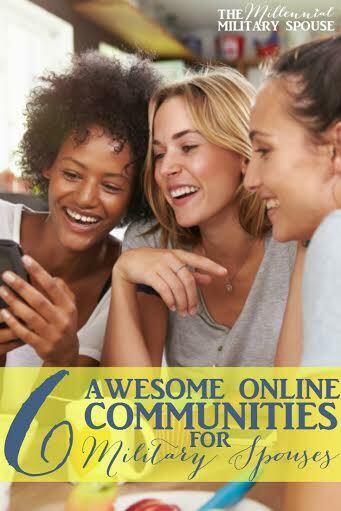 I’ve gathered six unique online communities just for military spouses. From forums to book clubs to articles, you’ll find a wealth of information and camaraderie in the groups that speak to your experience. While every military family is welcome at Homefront United, the articles and information are catered specifically to the National Guard and Reserves communities. Homefront United is written by Guard and Reserves spouses and they offer a wealth of knowledge and resources that you’ll be hard-pressed to find anywhere else. You’ll want to join their Facebook group, too, where they often post fun giveaways and opportunities. The majority of military spouses are female… but male spouses are a growing demographic and need a little representation too! Enter: Macho Spouse, a community specifically for guys who love members of the military. The site offers articles, video, and probably most importantly, forums where male spouses can connect with each other to ask questions and offer support. Military Spouse is both an online and print magazine that offers a variety of perspectives from the military community. If you’re not familiar with Military Spouse, you might be familiar with the Military Spouse of the Year competition that they run in conjunction with Armed Forces Insurance. Military Spouse also hosts active community forums. Honestly, sometimes the military lifestyle doesn’t lend itself to a healthy one. The spouses at InDependent are trying to change that by creating a community of military spouses interested in in health, fitness, and wellbeing topics. Read their articles and participate in the multiple Facebook groups dedicated to different health topics. You can even join groups that are location-based so you can connect with other spouses in your area. There’s no way this list could possibly be all inclusive… so what would you add? Where have you found strength, inspiration, empathy, and answers? What sites do you frequent? I want to hear all about them—leave them in the comments! I didn’t see anything on Home Buying Benefits for VA loans. Did I miss that bit of information? Give this link a try, http://milspousefest.wpengine.com/pcs-moving/#allowance. Hi I work for a Production Company that airs on Lifetime TV and we are in desperate need of a Military Family for this season, our family just dropped out, due to personal issues. We are currently in our 8th season and need help finding a family in this area, we usually travel but would like to keep it local this time. The family will of course have input on the style, look and feel of their renovated home. They will be working closely with our designer as well as vendors to choose everything to their liking. Below is a link to a promo for a past season. Thank you very much in advance for helping us find a deserving veteran and give back to these heroes who have sacrificed so much. I have a question about the GI bill. I want to use my husband’s GI bill and study associate in nursing. Will it cover all school expenses? Including all the lab fees, etc? Please help. First, you have to be sure that your husband has transferred the GI benefits into your name. The bill will not cover all expenses. Please go to their website for answers to all of your questions,http://www.benefits.va.gov/gibill/news.asp. I’m a new fiance to a US Army soldier he’s in basic training and we’re getting married next month after he graduates how long does it take for us to move in together and what do you have to do. I just got married and my husband is in the Army. We had to get an appointment to go to DEERS. We haven’t gone yet, but make sure RIGHT AFTER you get married to get an appointment. Otherwise you’ll be in for the long haul. Hi. What’s the best forum to talk about marriages and hardships with that? I want to talk to someone cuz I can’t talk to him about much. Please…I need help….engaged to ex Naval Officer…..our relationship has gotten so bad bc of his ptsd, and no emotions….making me feel unwanted…unloved….he can be mean and cruel at times with his words…..he hasnt been overseas for 9 years….my realtionship is at its breaking point….im trying to save my marriage before it even begins….please help me help him.